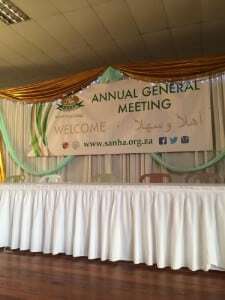 The South African National Halal Authority (SANHA) presented their annual audited financial reports on Sunday, and reported on the milestones and challenges regarding halal certification in their Annual General Meeting at Taronga Road Masjid Hall in Cape Town. Members of the ulema and public were welcomed with a melodious and heart felt recitation of the Quran by Sheikh Aziz Brown to grace the shared achievements and challenges of the non-profit organisation. Milestones celebrated included the new certification of 236 new plants with an aim of 40% of products at global supermarkets carrying the halal logo, approved submissions to government regarding halal labelling on food despite a bill not being passed, gaining accreditation of halal certification bodies to strengthen the integrity of the entity, initiating halal certification by non-muslims in Europe and creating awareness amongst the youth with school awareness programmes while promoting halal business. “With almost every avenue certified halal many would say that through these accomplishments, halal has gone mainstream. But we say mainstream has gone halaal. If you walk down a supermarket aisle you will find that almost 40% of the products carry the halaal logo,” says SANHA theological director Maulana Saeed Navlakhi. Despite these achievements, SANHA has faced many challenges. While attempting to halal certify a global market it has found the halal market to be a fragmented industry with poor networking due to the absence of global accreditation of halal certified bodies and a lack of funded academic research pertaining to halal certification. “The industry is characterised by fraud, infighting and greed due to a lack of global accreditation of halal certified bodies and networking that does not build connections. Another significant reason is the lack of academic research by scientists regarding halal products. “Muslims make up 25% of the world population yet generate less than 5% of its science. Only 0.5% has been spent on research in Muslim countries and by Muslims,” says SANHA chairman Yusuf Patel. SANHA is a non-profit organisation generating most of its revenue from its services rendered and donations. The committee is composed of non-paid executive members from other Muslim committees. According to its financial statements, SANHA has been in a dire position barely covering expenses with revenue of R18 696 771 in 2015 compared to R16 868 871 in 2014. The organisation’s expenses cost R18 565 777 in 2015, compared to the R16 306 496 in 2014. Other incomes include an additional R152 614 in 2015 and R77 095 in 2014. “Without our additional income we would barely make the financial year,” says treasurer Muhammad Seedat. SANHA appealed to the ulema to assist in making the markets halal.